For the Love of Oreos | Delicious! One of my favorite things about baking, or cooking in general, is that you can take something so simple and make it extraordinary. 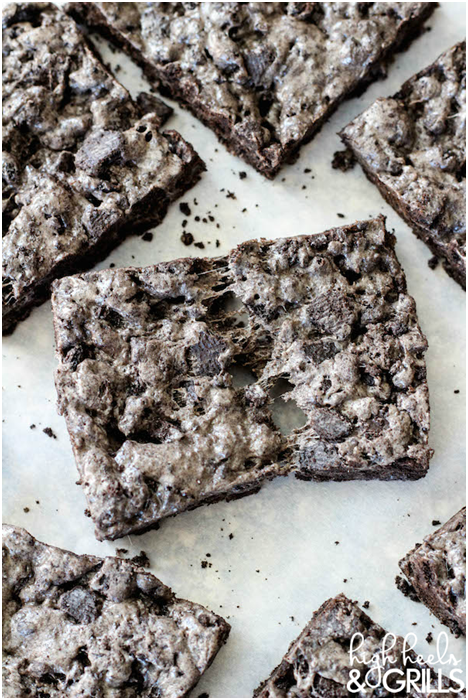 Oreo’s are a staple in many households across the country, or at least it is in mine) and though they are delicious on their own, they are incredibly versatile in baking. Don’t get me wrong, I love a good Oreo in its most pure form, but sometimes you want something a little more. Here are a couple of ways that you can take a favorite treat and push the boundaries while maintaining that mouth watering Oreo flavor. Place the Oreos (filling & all) in a food processor (in batches if necessary) and process until fine crumbs are formed and large chunks are gone. Mix in the softened cream cheese until very well combined and the dough becomes sticky. Roll about 1- 1 ½ tablespoons of dough into a ball and set aside on a plate or in a container that you can fit in the freezer. Freeze the balls for at least 30 minutes. Baker’s chocolate bars melt really well in the microwave and are ideal for dipping. (Chocolate chips, not so much.) Place the white chocolate in a small microwave safe bowl and heat for 30 seconds at a time, stirring in between, until melted. Cover a few small plates with wax paper. 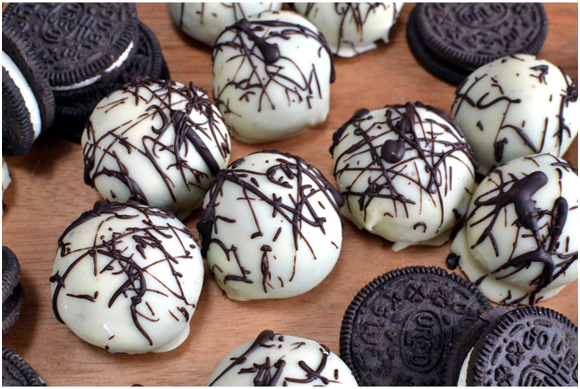 Remove 1-2 Oreo balls from the freezer at a time. Drop them into the chocolate and roll them around carefully with a fork (try not to pierce them) There is likely one part that is flatter, which was the bottom of the ball when it sat in the freezer. Slide the fork underneath the flatter part and lift. Slide the bottom of the fork across the edge of the bowl to let the excess chocolate drip off, then set on top of the wax paper. The chocolate sets pretty quickly which is nice, but I would transport them right to the fridge to speed up the process and keep them nice and smooth. This was just fun. I melted 6 oz. of the semi-sweet chocolate in a bowl and placed the balls on a large plate once they had all set. Then, I dipped the tip of a fork into the chocolate and shook it a bit to let some of the chocolate drip back into the bowl. Then, I raised the fork high above the truffles and waved the fork around so that the chocolate would fling off in thin streams onto the Oreo balls. It was really entertaining. I got chocolate all over the counter ; ) But they looked really cool so it was worth it. You can also top them with sprinkles or Oreo crumbs right after they’ve been dipped- then you’re done! Pour Oreos into a large bowl and set aside. In a medium saucepan, heat marshmallows and butter over medium heat until only a few lumps of mallows are left. Pour marshmallow mixture over Oreos and mix well until all the Oreos are coated. Press mixture into an 8x8 inch pan and let sit until cooled.